You are here: Home / Weekly Columns / Opinion / Huawei Mate 20 X Suffers Due To Google’s Hopeless Android System. Huawei Mate 20 X Suffers Due To Google’s Hopeless Android System. (ThyBlackMan.com) The Huawei Mate 20 X was compared with the Nintendo Switch. The CEO of Huawei Technologies Consumer Business Group Richard Yu himself showed off the new smartphone and told us how the Mate 20 X can be better than the Nintendo Switch in certain areas. The company knows that it is comparing a smartphone with a game console, and many people mocked Huawei for such a ‘strange’ comparison. It’s true that a smartphone can’t replace a game console, but it looks like some people are not seeing what’s missing from the whole scenario. There is no doubt that the Huawei Mate 20 X should not be compared with a video game machine, what is more, disappointing is that Google’s Android, after so many years, still focuses on adding more content to the Play Store instead of improving the quality of gaming on the platform. Companies like Huawei, Razer, Xiaomi, and Samsung bring the most powerful smartphones, but these devices can do nothing more than bringing an impressive spec sheet. Android is slowly killing the innovation because it’s a hopeless operating system. You may have noticed by now that more than 80 percent of gaming content on the Play Store is a waste. Game clones are available in all the categories. Some of them are fun, but we can’t see anything of value. There is a lack of games that inspire and convince us to kill time. Gaming on Android is no more fun. Speaking about the Huawei Mate 20 X, this smartphone features a 7.2-inch OLED display. Yes, it’s a lot better than the Switch’s 6.2-inch LCD screen. On the resolution side, the smartphone offers 1080p resolution, while the Nintendo Switch is limited to 720p. The difference in contrast and overall quality of visuals is significantly better on the Huawei Mate 20 X. Huawei also added a more powerful 5000mAh battery that lasts longer than the one of the Nintendo Switch. The Nintendo Switch beats Huawei’s Mate 20 X in terms of controls, design, and home console features it offers. One of the most important facts is the Switch has better games than the Huawei Mate 20 X. A large number of games which are available on consoles (both modern and old) will never come to mobile phones. Cross-platform games do exist, but there are only a few good games. Of course, Huawei won’t make video games just like how Nintendo or other console manufacturers do. We also can’t expect that Google will hire game developers so that they can build games for their hopeless operating system. We don’t expect anything like that, but what we expect from a software provider like Google is, dedicated support for gaming on Android. 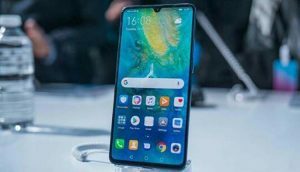 The Huawei Mate 20 X runs on Android’s latest version Android 9 Pie. Every year Google releases many features for its new version of Android OS, but we rarely see the company talking about Android games and Play Store content. Their experiments with UI and features for social media apps take away all the attention from gaming on Android. What disappoints the most is Google’s ignorance. There are companies who are ready to make smartphones packed with the latest hardware, powerful AI support, and innovative display technologies, but at the end of the day, despite having a lot better hardware, they are unable to attract people just because of Google’s hopeless Android system. The platform and its features look nothing more than a gimmick because Android is still forcing smartphone makers and consumers to use their mobile phones only for work and light entertainment. As gamers, we want to see a change in this scenario. It’s sad and shocking to see that even smartphone makers, who risk their business by labeling their phones as “phone for gamers”, are not even talking about it. For a company like Huawei, which was considered an alternative to big brand phones, launching a phone especially for gamers is a huge risk. Same goes for Razer and other manufacturers who are ready to take this risk. The smartphone industry is not fair to everyone, but still, there are companies who want to serve people that are sick of social media apps and other smartphone gimmicks. What do you think about the way Google treats gaming on its own Android operating system? Share your thoughts in the comment box below.